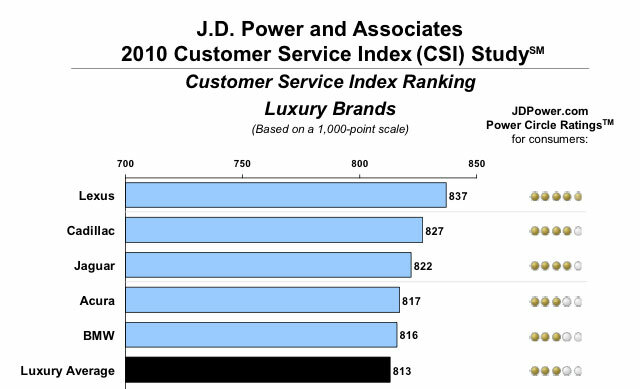 Lexus ranks highest in customer satisfaction with dealer service among luxury brands and receives an award for a second consecutive year. Lexus achieves an overall CSI score of 837 on a 1,000-point scale and performs particularly well in four of the five measures: service quality; service initiation; service advisor; and service facility. Rounding out the top five nameplates in the premium segment are Cadillac (827), Jaguar (822), Acura (817) and BMW (816).